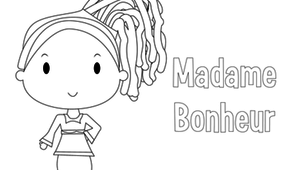 Madame Bonheur is also available on Mini TFO A section just for the kids, without ads! Click to explore! Madame Bonheur loves sharing touching moments with Louis, Josée, Lexie and mostly Charlie! She takes on a maternal role and offers a benevolent and reassuring presence. She's the mom on Mini! Madame Bonheur encourages kids to learn all kinds of popular dance moves and to stay fit with their family, friends and community. Madame Bonheur comes up with a fun dance routine: cross, uncross! MADAME BONHEUR inspire profondément avant de commencer à faire la danse du bonheur, qui consiste à croiser et à décroiser les jambes et les bras. On recommence? Oui? On y va! avec amour, joie et bonheur. Madame Bonheur encourages kids to learn all kinds of popular dance moves and to stay fit with their family, friends and community. Madame Bonheur comes up with a fun dance routine: happy feet! Madame Bonheur encourages kids to learn all kinds of popular dance moves and to stay fit with their family, friends and community. Madame Bonheur comes up with a fun dance routine: the slide! Mini TFO's friends sing along to Mini's theme song. In this clip, it is performed by Charlie and Mrs. Bonheur. Charlie assists Mrs. Bonheur. To complete a task, Mrs. Bonheur requests that he bring back a specific item, which Charlie doesn't know! Mrs. Bonheur must describe the object, providing a new hint after each attempt. Madame Bonheur encourages kids to learn all kinds of popular dance moves and to stay fit with their family, friends and community. Madame Bonheur comes up with a fun dance routine: the clown! Madame Bonheur teaches children a nursery rhyme! In this episode, Isabella recites a nursery rhyme about surprises! Madame Bonheur encourages kids to learn all kinds of popular dance moves and to stay fit with their family, friends and community. Madame Bonheur comes up with a fun dance routine: do the wave! Madame Bonheur teaches children a nursery rhyme! In this episode, Nephtali recites a nursery rhyme about sound! Madame Bonheur encourages kids to learn all kinds of popular dance moves and to stay fit with their family, friends and community. Madame Bonheur comes up with a fun dance routine: crazy moves! Madame Bonheur teaches children a nursery rhyme! In this episode, Lalie recites a nursery rhyme about movement. Madame Bonheur encourages kids to learn all kinds of popular dance moves and to stay fit with their family, friends and community. Madame Bonheur comes up with a fun dance routine: fly a plane! Madame Bonheur teaches children a nursery rhyme! In this episode, Carmen recites a nursery rhyme about a house. Madame Bonheur teaches children a nursery rhyme! 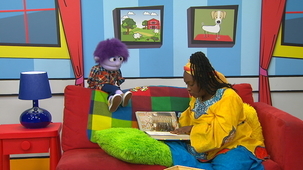 In this episode, Anisah recites a nursery rhyme about the body. Madame Bonheur encourages kids to learn all kinds of popular dance moves and to stay fit with their family, friends and community. Madame Bonheur comes up with a fun dance routine: run, fall! Charlie´s interactions with a baby teach him empathy and social skills. Charlie and Madame Bonheur celebrate Petite Chérie´s birthday. Madame Bonheur brings a bin or basket full of things... and she empties it in front of Charlie. And the colour game begins, a little different every time. 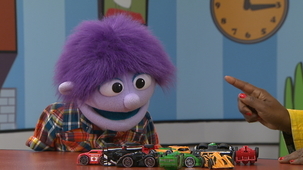 Charlie sorts the cars and trucks by colour! Short vignettes in which Madame Bonheur and Charlie have fun with rhymes! One of them says a word, and they take turns adding words that rhyme with it. 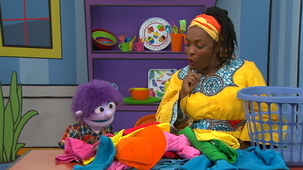 Madame Bonheur and Charlie make rhymes finishing in U.
Charlie´s interactions with a baby teach him empathy and social skills. Charlie acknowledges everything Petite Chérie has accomplished in a year. Madame Bonheur brings a bin or basket full of things... and she empties it in front of Charlie. And the colour game begins, a little different every time. Charlie needs to find blue clothes so Madame Bonheur can wear an all-blue outfit!